Yahoo And AOL Move In Together Under 'Oath,' Verizon's New Digital Arm : All Tech Considered The digital content mashup of Internet oldsters will be led by Tim Armstrong, AOL's CEO. Though the Yahoo deal was widely panned, it gives Verizon a vast subscriber base appealing to advertisers. 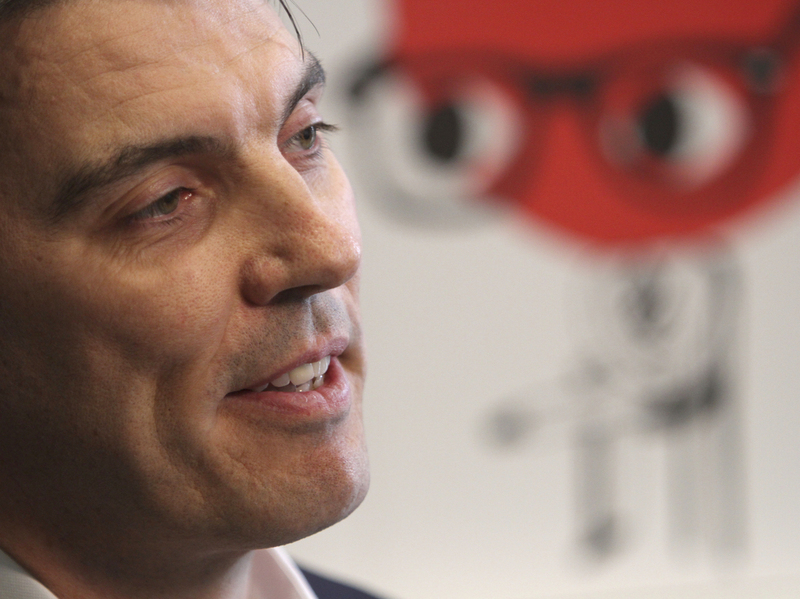 AOL CEO Tim Armstrong will take the same position at the head of Verizon's Oath. "The Oath brand is a brand that stays behind the scenes," he says. "The real brands that we're going to be promoting are things like Yahoo, Yahoo Finance, Yahoo Sports, TechCrunch, Huffington Post." Oath, the umbrella under which Yahoo and AOL will live, is the result Verizon's $4.5 billion acquisition of Yahoo — which it will merge with its AOL operations. Armstrong says users of Yahoo products will be able to keep using them, but they're probably going to see a lot more cross-promotion of content and brands owned by Verizon. Yahoo itself hasn't been able to really turn the popularity of its products into big money-makers. They'll try to change that under Oath and Verizon. Susan Etlinger, an analyst at Altimeter, says that combining customer data from Yahoo, Verizon and AOL could make it all more appealing to advertisers. "The big question in my mind is, what is it that Verizon is going to bring to the table from a data point of view that's going to enable them to patch this together into some kind of really useful ad targeting force?" Etlinger says. The combined subscriber bases could position Verizon well as the third-biggest player in targeted advertising, behind Facebook and Google, says Jimit Arora, who leads IT services research for Everest Group. He adds that the rebranding no different than when Google's parent company became Alphabet. Congress just eased Internet privacy regulations, which would allow Verizon to share and profit from a lot of the information it gets about Yahoo users. But that's a mixed bag, says Etlinger — because revelations about serious security breaches at Yahoo already have consumers on edge. "I think they're going to have a huge burden of proof that they can be trusted with the kind of data that they are going to be using" she says. Trust us, says AOL CEO Armstong — we've got your data and your back. "From our standpoint, there's an investment that will be going into a much deeper level of security," at both AOL and Yahoo, he says. "We've already greenlit that investment." Users will also be seeing changes in the companies' approach to their privacy. For example, they may have to change passwords more frequently, and there could be other levels security. "[We'll have] a system that we use that allows consumers to understand how their individual actions affect the security and readiness of their accounts," Armstrong says. The breaches that happened at Yahoo came under its current CEO, Marissa Mayer, who has been there for about four years. There has been a lot of speculation as to Mayer's future, but all Armstrong would say is that the new executive team probably will be announced in late June. Meanwhile, he is going to be in charge of some old Internet brands, and he says he plans to infuse them with new life and content. "If you come use our products and services, we will offer you the fountain of youth" — and Armstrong says that's an oath.